mkdir local-git-repos cd local-git-repos/ git init touch test.txt git add test.txt git commit -am "Added test.txt." echo aaaa >> test.txt git commit -am "Added aaaa." echo bbbb >> test.txt git commit -am "Added bbbb." git commit -am "Added test.txt." git commit -am "Added aaaa." git commit -am "Added bbbb." $ ls test.txt $ cat test.txt aaaa bbbb $ git log commit 15db9719b735c65b4d8ffc2cbf08b54ebad09e38 Author: Zhixiang Zhu <zzxiang21cn@hotmail.com> Date: Wed Jul 5 20:36:36 2017 +0800 Added bbbb. commit e1d6c1556fa210ca0a0b12e661ac5d23e5d215d2 Author: Zhixiang Zhu <zzxiang21cn@hotmail.com> Date: Wed Jul 5 20:36:35 2017 +0800 Added aaaa. commit d769c9a48932782a683336d478356ccd124077cd Author: Zhixiang Zhu <zzxiang21cn@hotmail.com> Date: Wed Jul 5 20:36:35 2017 +0800 Added test.txt. svn co file://`pwd`/svn-repos svn-client cd svn-client/ mkdir trunk branches tags svn add * svn ci -m "Added trunk, branches and tags." svn ci -m "Added trunk, branches and tags." $ git log --oneline --decorate --all --graph * d9b5878 (svn/trunk) Added trunk, branches and tags. * 15db971 (HEAD -> master) Added bbbb. * e1d6c15 Added aaaa. * d769c9a Added test.txt. * d9b5878 (svn/trunk) Added trunk, branches and tags. * 15db971 (HEAD -> master) Added bbbb. $ git rebase --onto remotes/svn/trunk --root master First, rewinding head to replay your work on top of it... Applying: Added test.txt. Applying: Added aaaa. Applying: Added bbbb. Use of uninitialized value $lc_author in concatenation (.) or string at /usr/local/Cellar/git/2.8.1/libexec/git-core/git-svn line 1639. Use of uninitialized value $lc_rev in concatenation (.) or string at /usr/local/Cellar/git/2.8.1/libexec/git-core/git-svn line 1640. 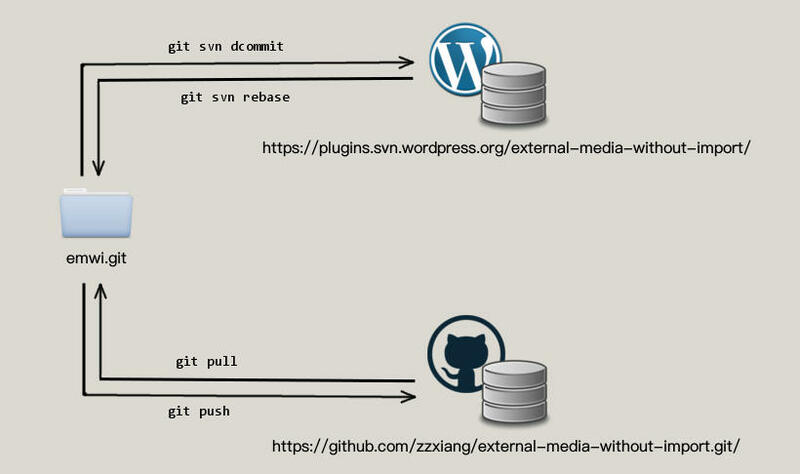 $ git svn tag 1.0 Copying https://plugins.svn.wordpress.org/external-media-without-import/trunk at r1669373 to https://plugins.svn.wordpress.org/external-media-without-import/tags/1.0... Authentication failed: No more credentials or we tried too many times. Authentication failed at /usr/local/Cellar/git/2.8.1/libexec/git-core/git-svn line 1196. Authentication failed at /usr/local/Cellar/git/2.8.1/libexec/git-core/git-svn line 1196.